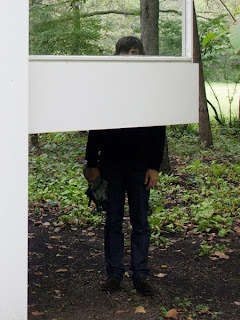 Beginning in January, Chicago's Matthew Friedberger - one-half of brother-sister duo the Fiery Furnaces - is planning to roll out a series of six solo albums on Thrill Jockey Records throughout 2011. Friedberger will kick off his Solos series with Napoleonette, featuring only the piano and his vocals. For a taste, check out a free download of one of the tracks, "Shirley," below. Each subsequent release will feature a different instrument and a new album will drop every two months. The six LPs are being sold as a subscription series, currently available for pre-order here. According to the Thrill Jockey press release: "...Each will be packaged in fully artworked jackets. The last album will be delivered to subscribers with an exclusive bonus of two exclusive full-length albums, featuring Matt and special guests on each. Subscribers will also get an LP box - old-style 'Tip On' with a hand mounted photo - in which to keep the Solos LPs. The edition of Solos is strictly limited to 700, and Solos will not be available digitally or on compact disc in its complete form." Friedberger is also planning to record the ninth Fiery Furnaces LP with his sister Eleanor before Christmas. Download MP3: Matthew Friedberger - "Shirley"